2 tbsp chopped parsley (1 tbsp parsley used for stuffing. Reserve 1 tbsp for garnish). 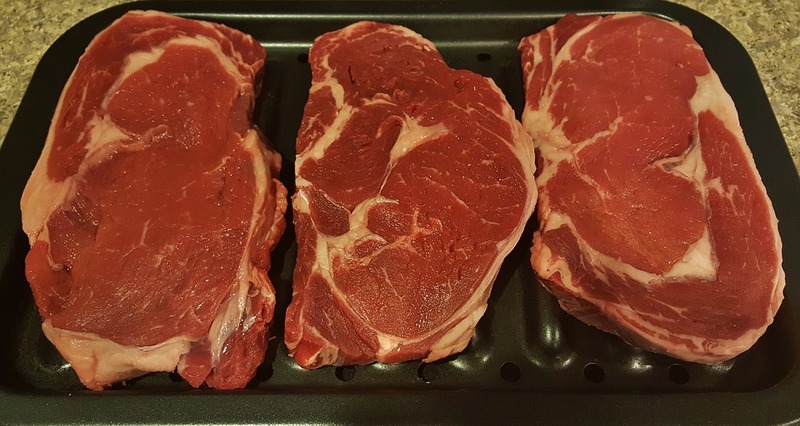 4 thick cut ribeye steaks (Thick cut NY strip, sirloin or filet mignon can be substituted). 8 oysters (2 oysers per ribeye, NY strip or sirloin, 1 oyster per filet mignon). Partially melt butter in the medium sauté pan. Add garlic and simmer until tender. Simmer while stirring with spatula until edges of oysters start to curl. “Wipe” all the ingredients from sauté pan out with spatula into bowl to cool. Add salt, pepper, 1 tbsp parsley, and blue cheese and stir thoroughly with spatula. Slice steaks in one side to make a pocket. Stuff steaks with stuffing mixture using 2 oysters per steak (1 oyster for filet mignon). Grill or broil to preferred temperature. Place potatoes on the plate. Using tongs place steak on the plate. (With mashed potatoes, the steak can be placed over the potatoes. Roasted potatoes or French fries can be places to the side of the steak). Place green vegetables to the side of the potatoes and steak. Sprinkle remaining fresh chopped parsley over each plate to garnish.